"Usha Projects (India) Pvt. 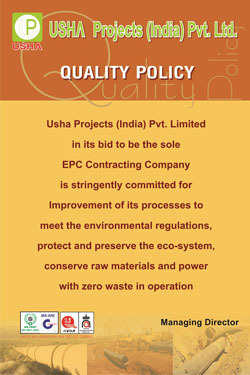 Limited in its thirst to be a leading EPC contracting company is committed its never ending quest for improvement of its processes to enrich customer satisfaction"
USHA has adopted right Quality System in its entire range of EPC operations ranging from Design to Commissioning of Projects. USHA has put in place its quality order to ensure that all aspects and stages of the construction activities is governed by the quality procedure laid down by the order. The quality checks are evolved into the system from the initial stages of Design, Procurement, Manufacture till the Execution of the project. USHA has executed several projects in India ensuring customers, the benefits of project execution with single point responsibility, focus on quality and completion within the stipulated cost.